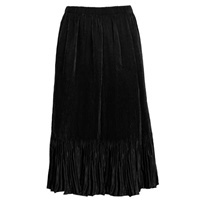 This gored skirt is a great cut for those who like more flare to their skirt. Looks great when coordinated with the tank tops, short or long sleeve tops or jacket. Has an elastic waist for comfort. 90% acetate, 10% spandex. Hand or machine wash. No iron. Made in USA.